Data sync and charge your device at the same time. Slim design, light weight, and easy to use. Share your photos and videos on big screen with family and friends. Great for presentation. Supports 720p and 1080p high definition output depending on your devices. Measures about 10cm long. Compatible with Apple iPad, iPad 2/3, iPhone 4, iPhone 4S - iPhone 4, iPad 1: can only view video clips recorded directly from the device only - iPhone 4S, iPad 2/3: can view both photos and videos. Use the Digital AV Adapter to mirror whatever's on your iPad 2 screen or iPhone 4S - apps, presentations, websites, and more - on your HDTV or HDMI-compatible display in up to 1080p HD (movies play at up to 720p). Watch slideshows and movies on the big screen in up to 720p by connecting your iPad, iPhone 4, or iPod touch (4th gen) to an HDTV or HDMI-compatible display. The Digital AV Adapter routes digital audio to screens that support it. 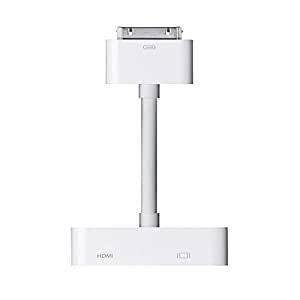 Connect the Digital AV Adapter to your iPad, iPhone 4, or iPod touch (4th gen) via the 30-pin dock connector and to your HDMI-compatible display using an HDMI cable (sold separately). A second 30-pin connector built into the AV adapter lets you charge and sync your device while it's connected to your HDMI-compatible display. 5.0 out of 5 starsIt works. Thank you so much for the false advertisement that this was Apple supported and my iPad said iPad not supported by this accessory. There is no need to waste money or time on a product that is not supported by Apple. Now I have to send this back and request a refund and find an apple supported device and wait for that to come to me. Awesome!! the quality is no good. the connection is not precise. it causes the TV lost signal frequently.